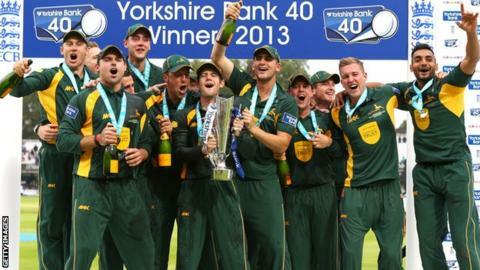 Nottinghamshire claimed their first Lord's one-day final win in 24 years as they beat Glamorgan by 87 runs. Chasing Notts' 244-8, spinner Samit Patel took three Glamorgan wickets in nine balls to inspire his side on the way to a comfortable YB40 final win. Nottsl owed much to a 99-run fifth-wicket stand between captain Chris Read (53) and Aussie David Hussey (42). Ajmal Shahzad and Stuart Broad then both chipped in with three wickets each as Glamorgan were bowled out for 157. That kept up the Welsh club's unwanted record as the only first-class county never to have won a final at Lord's. Of the original 17 first-class counties who began playing one-day cricket 50 years ago, this year's YB40 final was contested by the two with the fewest appearances at Lord's. Nottinghamshire, runners-up in the 1985 NatWest Trophy came back to win the same competition two years later, in 1987. And, having been runners-up in their first-ever Lord's final in 1982, in the Benson & Hedges Cup, they won that trophy too seven years later in 1989 - on their fourth appearance at Lord's, 24 years ago. Glamorgan have an even worse record in St John's Wood, having previously been to Lord's only twice before, as runners-up in the 1977 Gillette Cup final before suffering the same fate in the 2000 Benson & Hedges Cup final. England all-rounder Broad, called in to play his first one-day game for Notts since 2010, finished the game off with a burst of three wickets for two runs in six balls to earn his country their first silverware since claiming the Benson and Hedges Cup in 1989. And that made up for the taunting of this summer's Ashes central figure by Glamorgan supporters when he came in to bat earlier in the afternoon. The defeat maintained the Welsh club's unwanted record as the only first-class county never to have won a final at Lord's. Having won the toss and put Notts in, it soon looked ominous for Glamorgan when their opponents passed 50 in the ninth over. After beginning with a massive wide, Australian fast bowler Michael Hogan's unsuccessful shout for lbw against Michael Lumb with the last ball of his first over was the only sign of early danger. But, after Lumb in particular had tucked into Jim Allenby, a double bowling change after eight overs brought a double reward. With the score on 52, Lumb returned a catch to young spinner Andrew Salter to depart for 28 before Alex Hales followed in the next over, carving a catch to the deep cover boundary. On 80-2, Salter then struck again from the first ball of his fifth over when he removed Patel. And, again, the fall of one wicket triggered another. When Simon Jones had James Taylor caught behind to leave Notts 90-4 in the 19th over, underdogs Glamorgan were suddenly looking a good bet. It could have been worse for Notts if, in the next over, Gareth Rees had held onto a hard, low drive from Hussey to mid-off when he had made just three. As it was, Read and Hussey put on 99 from 93 deliveries, a stand that ended just after the start of the Notts powerplay. A ball after Read had reached a run-a-ball 50, with a lofted six over mid-on, he went for a short single on his own call to mid-off - and non-striker Hussey was run out by a sharp piece of work from Ben Wright. Michael Hogan's last-ball yorker to remove Stuart Broad leaves him on 99 wickets in all competitions this season - 63 in the Championship, 28 in the YB40 (the top wicket taker in the competition) and eight in the Twenty20. Read rapidly followed, hoisting Hogan to deep square cover. But the loss of two quick wickets for the third time in the innings did not halt Notts, as Graeme Swann and Steven Mullaney helped complete a tally of 47 from the powerplay. Graham Wagg bowled Mullaney for 21 with the last ball of the penultimate over but, with Swann scraping seven more off the final over to finish with 29 before Broad's golden duck off the final delivery, that left the Welshmen chasing 245 to win. Glamorgan got off to a bad start when skipper Mark Wallace carved Harry Gurney's first ball of the second over to Taylor in the gully, Rees following for a quickfire 29. From 42-2, Glamorgan's semi-final match-winner Allenby helped put on 66 for the third wicket before South African Chris Cooke was bowled for 46 in the 20th over by a big turner from Patel. That proved to be the beginning of the end, the first of three wickets for Patel for just four runs in nine balls as he also bowled Allenby for 34, then had Murray Goodwin trapped lbw. Shahzad joined in the fun when he removed Wright and Salter in the same over to finish with 3-33, before that perennial scene-stealer Broad rounded it all off.